NOAA ENSO Model Now Forecasting a Supercalifragilistic El Niño for 2015/16 Season | Watts Up With That? First: Congratulations to the teeny-tiny 2014/15 El Niño. It’s now official. NOAA included it as an “official warm event” on their Oceanic NINO Index this week. NOAA’s CFS.v2 model (dated April 9, 2015, source here) is now forecasting a strong El Niño for this upcoming ENSO season, or as blogger Alec, aka Daffy Duck called it, “a supercalifragilistic el nino” when he brought the forecast to my attention here. See Figure 1. That forecast is noticeably higher than the one that shows up on page 25 of the NOAA weekly ENSO update, which was dated April 4th. There are a number of aspects that may help in the development of a stronger El Niño this year than last. (1) This year’s downwelling Kelvin wave is a little later in the year, so it will be impacting equatorial sea surface temperatures later in the normal ENSO development “season”. Keep in mind that El Niño events are normally tied to the seasonal cycle. [See the post Why Do El Niño and La Niña Events Peak in Boreal Winter?] (2) The eastern tropical and equatorial Pacific (surface and subsurface) are warmer this year than last. 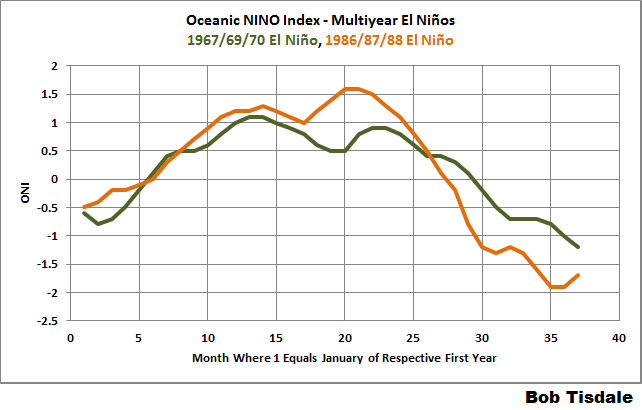 [See the March 2015 ENSO Update – Will the 2014/15 El Niño Become the 2014/15/16 El Niño?] (3) The downwelling Kelvin wave making its way across the equatorial Pacific is a little weaker than the one last year, but it’s still a reasonably strong downwelling Kelvin wave. But as we saw last year, the development of an El Niño can be suppressed by a lack of westerly wind bursts over the course of the year. Strong westerly wind bursts early in the year only initiate the process. They are needed throughout the rest of the year to strengthen the El Niño. Also, the upwelling (cool) Kelvin wave that should come next can offset the strength and impacts of the existing downwelling (warm) Kelvin wave. So part of the development will depend on the strength and timing of that upwelling (cool) Kelvin wave, too. For this discussion, we’ll refer to NOAA’s Oceanic NINO Index again. 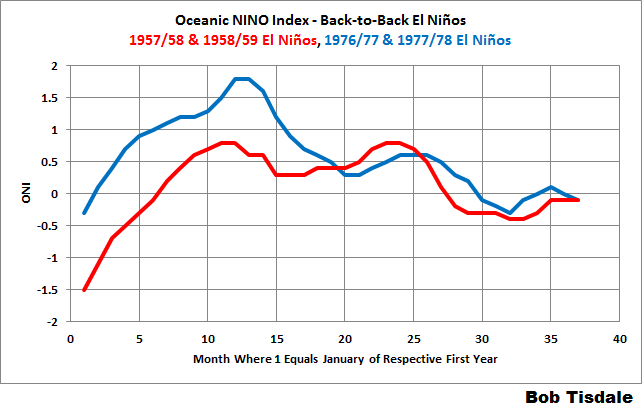 Of the 20 El Niño events since 1950 that are shown on the ONI index (in red), there are 2 pairs of back-to-back El Niños (the 1957/58 & 1958/59 El Niños, and the 1976/77 & 1977/78 El Niños) and two multiyear El Niños (the 1968/68/69 El Niño, and the 1986/87/88 El Niño). El Niño events normally evolve in one year and decay in the next, so I’m defining multiyear El Niños as those that developed in year one, extended through the second year, and decayed in the third. Bottom line: multiyear and back-to-back El Niños can and do happen. In other words, just in case some alarmists decide to get goofier than normal and try to make a fuss about a multiyear El Niño or back-to-back El Niños, there would be nothing unusual about either type coming to pass this year. As I noted a number of times last year, we’ll just have to watch and see what Mother Nature has in store for us. April 10, 2015 in ENSO. If one looks at the monthly data back to the 1950′,you can see El Ninos can turn in the space of 3 months to La Nina conditions. Thanks, Bob. Very good analysis. Bob, you tend not to make predictions in your posts, but it would help us who have less knowledge than you (which is most of us, IMHO) if you would prognosticate, guesstimate the odds of this or that (“I would suggest that there is a 35% chance of a back-to-back-to-back El Nino”), or weigh the alternatives (“There is a better chance I believe that there will not be a a back-to-back-to-back El Nino than the chance that there will”). Sorry, Madman2001, I don’t make predictions. Madman2001, Daniel, and Glenn999: See Joe Bastardi’s April 10, 2015 at 12:04 pm comment below. He makes predictions. One of your strengths is educating the rest of us on some pretty arcane, but usually meaningful, stuff. It’s just good clean fun to use your analyses in reasonably calm lunch discussions with equivacating-warmest friends…for example, your comments in this post about multi-year ENSO not being unusual or there being “no rules” about the relative strengths of the multiyear event peaks. Week in, week out, you demonstrate chunks of this climate stuff yields to good ‘ole analysis of actual data (as opposed to model tea-leaf reading). Please keep up the good work…and stay reasonably far away from “forecasting”. The warmer folks will be re-identifying weak La Ninas as El Ninos as we ‘progress’. I’m referring to the WUWT article “Warm Blob in Pacific Ocean”. Could a large blob of warm water be taking energy away from the energy needed to form an El Nino? My thoughts were along the same lines. Could it be blocking the winds that build up an El Nino? The California Current should be carrying the warmer-than-normal water from that blob southward. That would tend to enhance the El Nino. M Courtney, I don’t recall seeing any suggestions that the high pressure in the Northeast Pacific is impacting the trade winds or the westerly wind bursts. It just made sense to me that a large blocking high somewhere in the Pacific could disrupt the winds all round. But if you know of no evidence then I doubt there is any or will be any. Forecast shows the cooling south-eastern Pacific. It will be interesting. They’re bound to make a correct prediction one day, and what’s the point of predicting similar or lower temperatures if it won’t get you any media attention? Just how many times, and for how many years, have the NOAA forecasters of doom been wrong about El Nino? It’s gonna get hot, new records, oceans boiling, send money, yada, yada, yada. It seems that they have been prediction “the big one” for at least 4 years now. Please Bob, call it an Autumn or Fall prediction barrier, because that is what it is. The EN develops on the SOHEM and is thus basically a SOHEM phenomenon till it spreads, The months of FMA The so-called spring barrier months are the southern autumn. Maybe best to just use the month names. That would eliminate any perceived hemispheric-centrism. Duster, I will agree. In the future, I’ll call it the April-May-June prediction barrier. Harry, I’m curious as to why you’re saying that the EL Nino develops on the Southern Hemisphere. Please understand that I’m not arguing; I’m asking. Is it the Southern Oscillation Index? One can create an index from the sea level pressures in Hawaii and NW tropical Pacific that has a frequency and magnitude that’s very similar to the SOI. And NOAA created their equatorial SOI. Or is this a reference to the seasonal cycle in the sea surface temperatures of the tropical Pacific? These graphs help determine the environment from an atmospheric angular momentum perspective the probability of El Nino versus La Nina. Negative or tendency toward negative AM (ANGULAR MOMENTUM) favoring La Nina conditions while positive AM or tendency in that direction favoring El Nino conditions. Right now AM is in La Nina territory. This info. below being combined with the graphs from the link I sent above to get more data on Angular Momentum versus ENSO. The graphic above shows the tendency anomalies of the atmospheric angular momentum on the top panel, with the net tendency on the bottom panel. Notice how we’re currently recovering from a massive +AAM tendency spike, and are now in a net negative AAM tendency. The cause of this tendency is not the thing we will analyze; right now, we are noting that we’re in a +AAM state with -AAM tendencies. This fits well into the four stage descriptions of the Global Wind Oscillation (GWO), which takes those above graphics and makes them into useful data. Here’s the descriptions of all four stages of the GWO; pay careful attention to the first and last sentences of each stage. The four primary phases of the GWO are described below, along with generally cold season (November-March) probable weather impacts for the USA. The GWO recurrence interval, or “time it takes to make a circuit”, ranges from a broad 15-80 days. Two of the stages project strongly on El Nino and La Nina circulation states, which are also characterized by positive (Stage 3) and negative (Stage 1) global AAM anomalies, respectively. Stages 2 and 4 are transitional. Stage 1 (La-Nina like) – the global relative AAM anomaly is negative. The negative anomaly is primarily due to easterly upper level wind anomalies that extend from the Eastern Hemisphere tropics to the Western Hemisphere mid-latitudes. A retracted Pacific Ocean jet stream is a key feature in the total field. Troughs are probable across the western USA with a ridge over the southeast. High impact weather is favored across the Plains. Stage 2 – the global relative AAM tendency is positive. This means that negative AAM is being removed from the atmosphere by surface friction and mountains. At the same time, westerly wind anomalies are intensifying in equatorial regions of the Western Hemisphere. Fast Rossby wave dispersion events in both hemispheres are a coherent feature of this stage and Stage 4. A cold regime is probable across the central USA. Stage 3 (El-Nino like) – the global relative AAM anomaly is positive. Westerly wind anomalies move into the Eastern Hemisphere, broaden in latitudinal extent and link up with deep westerly flow anomalies over the mid-latitude Western Hemisphere. An extended Pacific Ocean jet stream and southward shifted storm track is observed favoring high impact weather events along the USA west coast. Stage 4 – the global relative AAM tendency is negative. Positive (westerly) AAM anomalies are being removed by surface friction in the Western Hemisphere mid-latitudes and through mountain torques across the Northern Hemisphere topography. The next phase of the oscillation (if there is one) is represented by easterly wind anomalies intensifying over equatorial regions of the Western Hemisphere. This stage has enhanced subtropical jets and closed lows in the subtropics favoring rainfall events over the southwestern USA. What did you notice in each stage description? Did you notice how each description began with details on how the net (global relative) AAM or AAM tendency was positive or negative? Let’s apply that here. We saw earlier how we are in a +AAM / -AAM tendency phase right now. Using those particular sentences in each description, it appears we’re in Stage 3 or Stage 4 of the Global Wind Oscillation. Let’s investigate each description closer. In Stage 3, among other details, the Pacific jet stream is extended (can stretch across the Pacific), and active weather impacts the West US. In Stage 4, the subtropical jet stream is strengthened, and closed lows in the subtropics can permit heavy rainfall over the Southwest. What’s AAM? It can’t be anomalous angular momentum since you refer to “AAM anomaly” twice. I agree Rick, not everyone knows all the acronyms so the terms with the acronym in parentheses is often a big help and makes the article or comment more valuable to many. Solar EUV is approaching a minimum. Strong Solar EUV , via Walker Cells, drives westerly winds. There will be very weak Solar EUV. No predictions, form your own opinion. My post at 8:00am was from the web-site the Weather Centre. They use AM as a forecasting tool. One has to be predicting an El Nino to develop based on the equatorial temperatures in the 100 metre deep Pacific Equatorial Under-current. The +4.0C and +5.0C above-normal water will start surfacing in the next few weeks and then one can see if the atmosphere partners in the ENSO either enhance it further or dampen it. Average temp anomaly in the top 300 metres. Basically agree, but this warm water is forming the wrong place. It is supposed to be further west in the “warm pool” which is currently anomalously cold, ready to reflect back with the next reaction wave. This may be something akin to the “Chen and Tung” effect where super saline solar warmed and evaporated water just sinks a bit from haline density. While anomaly makes some sense in the atmosphere by dampening diurnal and seasonal variation to something manageable, to my mind more is lost than gained using anomaly in the ocean. What will explain ocean density and vertical movement is absolute temperature and salinity, not anomaly. To my eye the NH trades currently hark from some zonal energy that does not involve shear along the coast of North America but shear along the equator, while the source of the energy for the SH trades is strikingly meridional with lots of shear along the coast of South America and little along the equator. How this plays to the fate of your central Pacific warm pool will be very interesting. in the opposite direction to the predicted ocean temperatures. That’s right NOAA show NINO 3/4 rising as sea temperatures are falling. So there will be reports of 2C global temperature anomaly as delegates arrive in Paris for ” the big one ” , the ultimate game- changing , economy- destroying , Gore- enriching climate change summit. Oh dear, bit of a nuisance that. Gore-enrichiching? Well, since Gore made the vast majority of his money off of Apple stock and the sale of Current TV, what specific investments are you referring to? Watch and see what Mother Nature has in store for us! Are you insane? 97% of all scientists know that reality doesn’t matter, if it’s not a computer model it doesn’t count. Models uber alles! When did the alarmists start to get interested in El Ninos? I thought their whole schtick was that CO2 drove climate conditions. The next thing you know they’ll start to look at solar variability, cosmic rays, clouds and all sorts of other variables that affect climate. Finally, they’ll have to admit that CO2 wasn’t that important after all. Welcome to the real world (sarc). Their dilemma is that whatever they dictate causes climate to change, it has to be anthropological in nature and support the current swing toward world governance of energy resources. It may take some time to adjust the paradigm to include the facts and still retain the illusion of humanity’s guilt. When did the alarmists start to get interested in El Ninos? Two giants of 20th-century meteorology, Gilbert Walker and Jacob Bjerknes, are usually given credit for discovering the El Niño-Southern Oscillation phenomenon. During the early 1920s, Walker empirically identified a periodic variation in atmospheric pressure over the Indo-Pacific which he christened the “Southern Oscillation.” During the 1960s, Bjerknes posited a physical mechanism to explain the atmospheric features of this phenomenon over the equatorial Pacific which he christened the “Walker Circulation.” Both men deserve recognition since they opened the way for our present understanding of the global climate system. I thought their whole schtick was that CO2 drove climate conditions. Modern climate change is dominated by human influences, which are now large enough to exceed the bounds of natural variability. The main source of global climate change is human-induced changes in atmospheric composition. These perturbations primarily result from emissions associated with energy use, but on local and regional scales, urbanization and land use changes are also important. Although there has been progress in monitoring and understanding climate change, there remain many scientific, technical, and institutional impediments to precisely planning for, adapting to, and mitigating the effects of climate change. There is still considerable uncertainty about the rates of change that can be expected, but it is clear that these changes will be increasingly manifested in important and tangible ways, such as changes in extremes of temperature and precipitation, decreases in seasonal and perennial snow and ice extent, and sea level rise. Anthropogenic climate change is now likely to continue for many centuries. We are venturing into the unknown with climate, and its associated impacts could be quite disruptive. That’s not an atypical abstract. The next thing you know they’ll start to look at solar variability, cosmic rays, clouds and all sorts of other variables that affect climate. By reflecting solar radiation back to space (the albedo effect of clouds) and by trapping infrared radiation emitted by the surface and the lower troposphere (the greenhouse effect of clouds), clouds exert two competing effects on the Earth’s radiation budget. These two effects are usually referred to as the SW and LW components of the cloud radiative forcing (CRF). The balance between these two components depends on many factors, including macrophysical and microphysical cloud properties. In the current climate, clouds exert a cooling effect on climate (the global mean CRF is negative). In response to global warming, the cooling effect of clouds on climate might be enhanced or weakened, thereby producing a radiative feedback to climate warming (Randall et al., 2006; NRC, 2003; Zhang, 2004; Stephens, 2005; Bony et al., 2006). Yes, the Sun. As well, many other factors far more obvious than cosmic rays. It’s almost as if you’re not the only person thinking about this stuff. Finally, they’ll have to admit that CO2 wasn’t that important after all. Odd conclusion considering that these so-called “alarmists” are the ones mainly responsible for what little you apparently know of them or their research. You forgot human induced post climate change? That’s quite an amazing assertion, isn’t it? Modern climate change is dominated by human influences, which are now large enough to exceed the bounds of natural variability. But that’s all it is: an assertion. It’s pretty much a baseless asserrtion, since the climate Null Hypothesis has never been falsified: nothing we observe now is either unusual, or unprecedented. All current climate parameters have been exceeded in the past, before human CO2 was a factor. The truth is that we have been blessed with a real ‘Goldilocks’ climate for the past century. There is no credible evidence that human CO2 emissions have had any negative effect at all. The only real evidence we have shows that the rise in CO2 has been an unmitigated benefit to the biosphere. All the scare talk about runaway global warming has been debunked by Planet Earth herself. The authors completely disregard reality. They disregard all contrary facts and evidence. Because if they told the truth – that nothing abnormal is occurring – they probably would not be able to parlay their paper into grant loot. Government grant money has thoroughly corrupted science: Scientists have been trained with grant money like Pavlov’s dogs were trained with dog biscuits. You’re killin’ me here, son. Most “greenhouse gases” in the atmosphere (especially CO2) are NOT “well-mixed”, so even if the above curve showing the influence of “well-mixed” greenhouse gases were even remotely correct (which it is not), it wouldn’t be relevant anyway. Even H2O, the most abundant and most important “greenhouse gas” in the atmosphere is far from “well-mixed”. So basically, there are 2 MAJOR flaws with the whole AGW theory. Flaw #1, CO2 is more important than H2O (no) and Flaw #2, greenhouse gases are well-mixed in the atmosphere (no). Unless of course they start propagandising about a made-up (read: fantasist) link between CO2 emissions and El Nino behaviour…???? You know the cultists are capable of saying anything. A CO2 —> El Nino link is non-obvious to me, but then so are the workings of any ocean/atmospheric coupling. It’s a fiendishly complex system and I would not presume to know fantasy from fact by my own lay reasoning about it. For that I must turn to experts with specific training to the problem domain in question, and where I prefer to go first for that is to peer-reviewed primary literature. Speculating that prestige for-profit journals are part of some cult is the thing which smacks of propaganda to my eyes. YMMV. How can a physicist not comprehend that it is atmospheric CO2 that is the principal radiative forcing agent for the ongoing global warming? . . . and not be concerned that water vapor, as the climate system’s principal feedback agent, has an exponential dependence on temperature? To be sure, there are other factors that contribute to climate change. But decades of measurements and analysis have shown that variations in solar irradiance, land use, aerosols, ozone, and other minor greenhouse gases, while making a contribution, are small by comparison to CO2. Of greater interest is the “unforced” variability of the climate system on decadal time scales that arises from changes in ocean circulation patterns that are effectively un-influenced by changes in atmospheric radiative forcing. The deep ocean is a very large cold storage reservoir. An upwelling blob of cold ocean water can put a “pause” in the ongoing global warming, temporarily diverting the greenhouse “heat” to warming the ocean. But once that cold blob of ocean water has been warmed up to its equilibrium temperature, it is back to the business of continued global warming. And also note that the ocean cannot cause a decadal warming spurt – the deep ocean is colder than the surface biosphere, so it cannot be a source of heat. Significantly, the key climate system components (water vapor, clouds, ocean) are not configured to respond to radiative and/or temperature perturbations on a sufficiently small enough incremental scale that would permit a monotonic approach to global energy balance equilibrium. Instead, there is always over-reaction such as when water vapor condenses en mass to produce storms, coupled with the similarly over-reactive responses by atmospheric and ocean dynamics to pressure-temperature and salinity differences, to produce the quasi-chaotic weather and the longer-term climate noise that characterizes the climate system. Physicists should not be confused by these random-looking quasi-chaotic fluctuations about the local climate equilibrium point, and should instead focus more on the changing energy balance equilibrium point of the climate system. They should also pay attention to the geological record that points to an atmospheric CO2 level of 450 ppm as being incompatible with polar ice caps, a level that is expected to be reached by the end of this century. While it may take a thousand years for the polar ice to melt, the future course is being prepared for a 70 meter rise in sea level. That is only part of his comment. It is one of the more succinct yet comprehensive summaries of the “problem” of internal variability I have ever read. They should pay more attention to the geographical record that points to a detached Antarctica, a northerly Greenland and an open Isthmus of Panama as being incompatible with ice-free poles. Cart before the horse. Let’s try this the easy way: the reason you know about those things is because nobody paid attention to them. Interesting graphs. Don’t forget this is not actual heat energy it is an “anomaly” from a four dimensional average condition. ( long,lat, depth,time). The vertical cross-section is misleading because it does not show one of those dimensions. It does not account for N/S movement of water. That is where the real heat anomalies come from. The equatorial anomalies come from a depression of the thermocline. The warmer surface water is lowered and appears as a warm anomaly. Much of what this plot shows is vertical displacement anomaly not an increase of heat energy. Looking at the second graph, we see two bands at 40N and 40S and a third around the equator. I think much of this pattern is long term tidal effects. I think it is Clarke that did a paper on thermocline movement but he did not make the tidal link. On that cross section, how can so much temperature rise happen in just a few days, given that it is shown to be at depth and not particularly connected to the sunlit surface? I was hoping, Mike, that you provided a reasonable answer, but then Bill Illis disagreed. So, where is the energy coming from? There is no North-South movement at the equator – until the water flow runs up against a continental shelf. One should think of this cross-section as showing water at the surface moving east to west as it dragged along by the east-to-west trade winds. It then travels in the equatorial under-current (the Cromwell Current) at 100-150 metres depth back across the Pacific to the east. It then surfaces at Galapagos Island and the loop is complete. The majority of the water in the equatorial Pacific is just recirculating in one long continuous loop. Some of course is exiting the system through the Indonesian Flow-through and some is going into the North Pacific Gyre in the Kuroshio current. And then some is entering the loop pattern from the Humbolt current along the South American coast, and some is entering from the Tehuantepec upwells next to central America (but noone is really certain how this works here). The whole ocean is full of these types of surface currents and under-water counter-currents going in the opposite directions and then just 8 degrees away latitude, all the currents now flow the same way but in the opposite directions again. If the ocean water is moving, wherever it is going, some other water has to be moving away to make way for it. And wherever the water is coming from, some other water is moving in to take its place. Its all just circulating in short-term continuous loops and/or long-term continuous loops taking years or decades or centuries. The equatorial Pacific is actually the easiest place on the planet to understand as it a short-term one and not that complicated and it has great monitoring systems. The Eastern Pacific Blob vs. El Nino in the meteorological grudge match of the year! until then, would someone wake me up when a real El Nino gets here? i’d hate to drown in my sleep. The thing is that water is drawn to the equator and thus depresses the thermocline. This shows as a warm “anomaly” in the vertical section. Frankly, this el niño is not only supercalifragilistic, it’s supercalifragilisticexpialidocious. Thanks Bob. I notice a “cold” spot west of the Kelvin wave. Isn’t this supposed to be the source region for future warm water that would move eastward with westerly bursts? R2Dtoo, yes, there are below-normal subsurface temperature anomalies in the western tropical Pacific. Phrased differently, yes, they’re showing that there is presently less warm water than normal to supply El NIno development. Two things to keep in mind. (1) Sea surface temperature anomalies in the eastern tropical Pacific are already elevated. And (2) El Nino events rely on the temperature difference (absolute) between the western tropical Pacific (warmer) and the eastern tropical Pacific (cooler). The below-normal subsurface temperatures in the western tropical Pacific we’re seeing now wouldn’t prevent an El Nino. It just has less fuel for development. We anticipate that the 2015 Atlantic basin hurricane season will be one of the least active seasons since the middle of the 20th century. It appears quite likely that an El Niño of at least moderate strength will develop this summer and fall. The tropical and subtropical Atlantic are also quite cool at present. We anticipate a below-average probability for major hurricanes making landfall along the United States coastline and in the Caribbean. Despite the forecast for below-average activity, coastal residents are reminded that it only takes one hurricane making landfall to make it an active season for them. They should prepare the same for every season, regardless of how much activity is predicted. Information obtained through March 2015 indicates that the 2015 Atlantic hurricane season will likely have much less activity than the median 1981-2010 season. We estimate that 2015 will have only 3 hurricanes (median is 6.5), 7 named storms (median is 12.0), 30 named storm days (median is 60.1), 10 hurricane days (median is 21.3), 1 major (Category 3-4-5) hurricane (median is 2.0) and 0.5 major hurricane days (median is 3.9). The probability of U.S. major hurricane landfall is estimated to be about 55 percent of the long-period average. We expect Atlantic basin Accumulated Cyclone Energy (ACE) and Net Tropical Cyclone (NTC) activity in 2015 to be approximately 45 percent of their long-term averages. Great weekly video this week on weatherbell.com. “Australia will face fiercer El Nino weather patterns – causing severe drought – as a result of human-induced global warming, world-first research led by Sydney scientists has shown. While the El Nino cycles typically trigger drought in the eastern states, so-called super El Ninos – such as those in 1982 and 1997 – have been detected since the mid-1970s. “Recently speculation has been rife that the end of 2014 will see an El Niño event — the change in Pacific ocean and atmosphere circulation that is known to produce drought, extreme heat, and fire in Australia. “Climate scientists are monitoring this with amazement,” said Cai Wenju, a principal CSIRO research scientist who has published widely on the El Nino Southern Oscillation (ENSO) climate pattern. Handjive.. thanks for a little comic relief. There has been a less than expected response by the atmosphere to the oceanic, surface warmth in the Pacific. In fact, the atmosphere over the US this past Winter, acted like it thought we were in a La Nina. The huge, surprising spike higher in the PDO over the last year, may have peaked in December 2014(2.5) but at +1.5 in March, is still high. Surprising, because it’s coming during a -PDO phase(which is either ending prematurely or doing like the late 1950’s and spiking higher, then going back to a -PDO regime for another 15 years or so). The only other time we saw +PDO index values this high was in 1997/98 in tandem with the Great El Nino. Maybe the AMO signal has been more powerful than the PDO recently for US weather.
. ” The only other time we saw +PDO index values this high was in 1997/98 in tandem with the Great El Nino” Not true, Mike .. Check 1940/1941 PDO levels . Pdo up to 3 and lasting much longer. Remember what happened to Europe and Asia winters . GMST showed no significant warming. With the El Nino confirmed, should we have seen some warming in the record? That should not be a surprise given the current Pacific Ocean conditions. My outlook from last August on the upcoming winter was that California was going to have a warm winter. It certainly was and that was a nice relief from the previous 3 very cold winters. The change was around +20 F difference. California has dewatered aquifers, deforested, paved, farmed and otherwise reduced moderating evaporative cooling. Not to mention NOAAHAHAHA’s propensity to produce warming slanted graphs. Time for those 40 million ingenious people to be ingenious. sure the curve would be very impressive if nothing elese but climate would have changed in california.. This time last year they were predicting a whopper too. They better watch it or their reputation is going to start looking like UK Met Office winter forecast reliability. Martin “It sure is hotting up in California ” , you said . You should be aware that it is sure freezing up in the rest of the country . Many regions in the North east US and Canada had the coldest February ever.
. Despite all the warm SST in the eastern and central Pacific . North America has been cooling since 1998. CONTIGUOUS US is cooling at a trend of 0.48F/decade SINCE 1998 per NOAA. How come you cherry picked 1998? Is it because that was a massive record breaking El Nino? I’ll cherry pick 10 years later with 2008 and see what the trend is per decade. Ohh looky it’s 1.10F/decade! See comments from one article below. I posted the information here at this time to bring balance to the discussion about the “heating ‘”up of California. Their water problem is critical and I am sympathetic to their woes but so are the extra cold temperatures, snow, flooding and tornadoes that sweep over US eastern half because of the extra cold spring winds from the north meeting the warm moist air from the south. Let’s move away from 1997 then. Five years later we get this. I suspect this might be the last gasp of the current weak El Nino. It has been using the energy stored in the western warm pool over the last year and has not been able to couple to the atmosphere due to warmth in the indian ocean competing for the convective focus. (neg IOD) If the atmosphere does get is act together then we are likely to get a moderate El Nino at the strongest. Super El Nino probably only occur after significant periods of energy accumulation. Cloud decreased by 5% from 1992-2003 and the Super El Nino was the energy dissipation response. A similar shift is believed to have occurred in the late 70s which would time with the 82 super El Nino. El Nino’s dissipate energy, they source it from the Western warm pool thermal energy and gravitational potential energy from the water piled up, along with the kinetic energy from slowing wind circulations, plus some initial positive feedbacks such as disruption of convective cooling. Without a atmospheric connection we are likely to regress back two neutral rather than La Nina IMO. If the atmosphere does connect then its game on for the next super La Nina. Many regions in the North east US and Canada had the coldest February ever. And yet, the north east is where all the CO2 is produced?? If my computer spit out a graph like the first one on this post, I would immediately start looking for my mistakes. It’s still (boreal) springtime, and ENSO forecasts have a hurdle called the “spring prediction barrier”. What’s “boreal springtime” and how does it differ from meteorological spring? adj. Of or relating to the north; northern. adj. Of or concerning the north wind. adj. Of or relating to the forest areas of the northern North Temperate Zone, dominated by coniferous trees such as spruce, fir, and pine. It seems odd to me to use the northern woods to describe a time period in the tropical Pacific. As an observation, statistical predictions are generally lower than modelled predictions. I’m only assuming but, perhaps the models actually incorporate ghg effects. Repetition of reality doesn’t. It is a fact that the solar magnetic cycle has been interrupted. An analogue of what to expect next is the 8200 BP (before present) abrupt cooling event. The cult of CAWG would most certainly use a El Nino event or a drought or high rainfall or high snowfall or regional cold weather as further proof that we must spend trillions of dollars on green scams that do not work. I am not sure how they could use a significant drop in planetary temperature as further proof of CAGW. It is a fact there is cyclic significant warming and cooling (sometimes abrupt cooling events) in the paleo record that correlate with solar cycle changes. 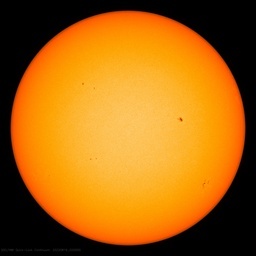 The sun is the cause of the majority of the cyclic climate change in the paleo record, including the majority of the warming observed in the last 150 years. If there is a significant drop in planetary temperature, there will need to be a very quick sciency sounding explanation. There will be much hand wringing as it becomes obvious that the entire set of IPCC assertions were incorrect. We then will need to quickly accept the end of CAGW and quickly move on to discuss an unimaginable climate change scenario. We will need to discuss the implications of significant and dangerous abrupt cooling. It appears a Heinrich event will immediately follow the initial Dansgaard-Oschger cooling. If that assertion is correct we need to determine timing, magnitude, and start making changes to mitigate consequences. There is a miss understanding, a urban myth, that the glacial/interglacial cycle occurs due to tiny forcing changes (summer insolation changes at 65N for example or a stoppage of the North Atlantic drift current) that are serendipitously amplified by a smart amplification mechanism that appears when required to end and start interglacial periods and then serendipitously disappears to avoid creating large, abrupt planetary temperature oscillations when there is a short term major forcing change such as super volcano eruption. Ridiculous urban legends are accepted as it difficult to even contemplate the possibility that the sun and the stars are fundamentally different than assumed. The 8200 BP event was not caused by a stoppage or a slowdown of the North Atlantic drift current. The assertion that a stoppage or slowdown of the North Atlantic drift current could cause the a significant drop in winter temperatures in Europe and in the Greenland Ice sheet is an urban myth. The 8200 B.P. event, “lasted four hundred years (6400-6000 B.C.) and, like the Younger Dryas, generated abrupt aridification and cooling in the North Atlantic and North America, Africa, and Asia (Alley et al. 1997; Barber et al. 1999; Hu et al. 1999; Street-Perrot and Perrot 1990). An answer to the long-standing riddle of whether the Earth’s ice ages occurred simultaneously in both the Southern and Northern hemispheres is emerging from the glacial deposits found in the high desert east of the Andes. Because the Earth is oriented in space in such a way that the hemispheres are out of phase in terms of the amount of solar radiation they receive, it is surprising to find that the climate in the Southern Hemisphere cooled off repeatedly during a period when it received its largest dose of solar radiation,” says Singer. “Moreover, this rapid synchronization of atmospheric temperature between the polar hemispheres appears to have occurred during both of the last major ice ages that gripped the Earth. In the south of the jet stream in winter descends farther north Pacific and warm air mass pushes further north. In the south, also starts strong inhibition of the polar vortex, because the magnetic activity of the sun falling. Sorry, I need more coffee before I can even begin to decipher that sentence structure. ren’s English is probably a lot better than my Polish. You keep saying this but what evidence do you have? Looks to me like the pole switch was a little more drawn out than the other three we have data for but now seems to be proceeding normally. Sure, Cycle 25 looks like it’ll be weak but even that isn’t a done deal yet. In the context of drawn out Cycle 23 are you suggesting it isn’t? Where is this “interruption”? Why not 1997? Not that we’re talking about the solar magnetic cycle being interrupted. Perhaps William meant geomagnetic but where is the Ap Index for 8200 BP? This El Niño is going to turn out to be quite atrocious for them. I observed about a month ago (?) BOM model selection was predicting a 1.5C event. Shouldn’t such hard to spot El Niños be called “El Ninjas”? I have tried to find an email address for you, but in vain. You can get my address from Anthony, I am sure, so please send it through him, so we can discuss the SO privately. If it stop rain here shorty after one month El Nenos forecast get stronger. The continuation of the minimal El Nino and the beginnings of a new potentially stronger El Nino is already leaving its signature in the Out-Going Long-Wave at equator, International Dateline area. This is really how the ENSO impacts temperatures on a regional, tropical and global scale. There is large continuous convection storms here now and the clouds themselves, holds in all that energy coming off of all that hot water at the equator. The energy does not get to escape to space as readily as it normally does and this extra energy held in spreads to the rest of the world in a month or two. It takes 1 to 2 months for the large increase in tropical storm activity to develop and then one to two months for the extra heat held-in to spread to the rest of the world. This is the formula for why there is a three month lag from the ENSO to where it starts to impact tropical and global temperature. It is the explanation for why there is a lag. This chart shows what is going on in this very special region on the planet which is somewhat like the planet’s thermostat but more like the ENSO’s thermostat impacting the rest of the planet. The changes in Out-Going Long-Wave here are truly massive. +/- 50 W/m2 which completely dwarfs the variability that any other place on the planet has by almost an order of magnitude. When it is “Yellow”, this means more OLR is gettting out to space than normal and the planet is cooling off slightly. When it is “Blue” less energy is escaping and the planet is heating up. Right now, we are very strongly into the Blue, some -50 W/m2 time-periods are showing up and global temperatures are now going to be going up fast. The El Nino is already starting to have an impact which will be apparent shortly. Bill in a word you are wrong. What will determine the strength or lack of strength of El Nino is the SOI INDEX values which are related to the pressure differences between Tahiti, and Darwin Australia, which are related to the amounts of warm water around Australia. The warmer the water is around Australia, the lower the pressure will be at Darwin , in contrast to Tahiti ,which equates to a more positive SOI INDEX which is not supportive of El Nino being sustained much less a strong El Nino. As of today warm water anomalies rather then cold water anomalies are present around Australia. Another indicator is angular momentum which is neutral at best. Positive values or heading positive =El Nino, more likely. Negative angular momentum values or heading toward negative values = La Nina, more likely. To boot recent OLR values increasing in said area Bill references. According to Bill a big El Nino should have followed approximately 3 months later the extreme -OLR period from Jan 2010-Apr.2010. I see La Nina instead. The 2009-10 El Nino peaked at +1.9C in the week of December 23, 2009, and the negative OLR values followed in the few months later just like I said. Nice graph above, I have never seen that particular one before. Note well who you are talking to in respect to how he answers you. I should have said more accurately El Nino heading to neutrality for the three months following -OLR period Jan- Apr. 2010 ,followed by a strong La Nina some 9 months later. Bill , the way I read it you said originally that El Nino is in response to -OLR and not the other way around. Here is what you said originally. Then you say this which is opposite to what you said in the above. Lag versus followed. Which one is it? Maybe I read it wrong now that I have read many times. Maybe you were trying to say the lag between an ENSO event and the effects from this ENSO event takes two to three months, due to -OLR , and hence tropical storm development/heat spread. If so I understand the point you were trying to make and I say time will tell. Yes, the -OLR values lag behind the Nno 3.4 Index (in an El Nino). The large +OLR values lag behind a La Nina. This area is also important because the heat distribution from the equatorial region to the poles is very strong here and many of the systems move directly north (or directly south) from this important region and then catch the mid-latitude winds now going west-to-east which mean the west coast of North America and the area from Alaska to Minnesota are the regions second most impacted by the what is happening with the storm systems here. The most impacted region is Indonesia and Australia (because the most important winds are the trade winds which move the majority of the systems at the equator from east-to-west). When there are large convection storms at the International Dateline area (like now in an El Nino), the moisture rains out here and Indonesia and Australia get much reduced rainfall. The opposite happens in a La Nina. The 77-77 one did not break the bad 70s drought but the following 77-78 one did. Hoping for a repeat.